Rising temperatures and ice melt are drawing a growing number of researchers to the Arctic, as well as businesses, security experts and policymakers hoping to reshape the region's policies. 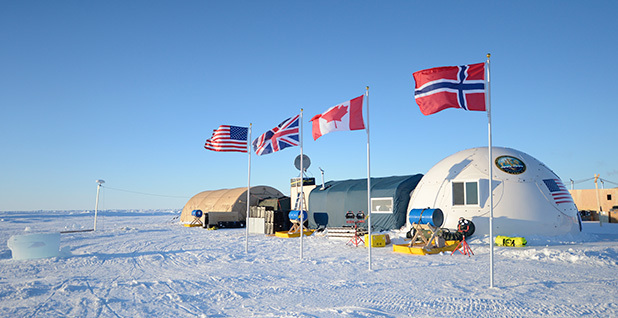 Ice Camp Sargo in the Arctic Circle, shown above, will host 200 participants from four nations later this year at a gathering aimed at testing and evaluating defense readiness in the region. Photo courtesy of the Department of Defense. The Arctic Council is suffering growing pains as rising temperatures from climate change create serious problems for the region's people and ecosystems, while also opening lucrative business opportunities in the Far North. The Arctic's shifting conditions are attracting attention from a broad cross-section of international interests -- from scientific researchers and environmental activists to non-Arctic nations and corporations. Seeking to influence Arctic policies, those parties are flocking to the Arctic Council, the only high-level intergovernmental organization focused on Arctic issues. Created 20 years ago, the council was formed by the eight nations that border the polar region: Canada, Denmark, Finland, Iceland, Norway, Russia, Sweden and the United States. Leadership of the group circulates among member countries every two years. The United States is the current chair, with Finland due to take the lead in May 2017. The Arctic Council was originally designed as a loosely structured, informal diplomatic forum focused on the Arctic environment and sustainable development issues. The panel has no authority to regulate or to commit the eight nations' funding to any of its projects. But over time, the council has expanded its agenda to address a broad cross-section of critical challenges facing the northern nations as the Arctic continues to warm at twice the rate of the rest of the world. The United States has made climate change the top priority of its chairmanship, persistently urging the circumpolar nations to take a leadership role in countering the impacts of the warming Arctic. A council working group is crafting a plan to cut international black carbon and methane emissions, which are adding to Arctic warming pollution. "If we can reduce emissions of black carbon, we can make a dent in climate change in the North," U.S. Ambassador David Balton asserted at last month's meeting of the Arctic Council's senior officials. "We are pushing as hard as we can to get Arctic states and the near-Arctic states to do just that" (ClimateWire, March 21). Another Arctic Council committee is developing proposals to establish a network of marine protected areas throughout the Arctic, with the ultimate goal of having at least 10 percent of ocean space subject to some form of protection by 2020. That goal comes at a time when the increasingly ice-free Arctic waters are attracting interest from the world's shipping, resource extraction and fishing industries. But some international experts suggest the time has come for the Arctic Council to consider a more activist, leadership role to address the physical transformation occurring in the polar region and the growing international focus on all things Arctic. A recent report by the Council on Strategic and International Studies calls on the Arctic Council to adopt a new organizational structure that could anticipate future challenges and develop more immediate policy responses. The study, "An Arctic Redesign," says that unless such changes are made, "the Arctic Council is poised to become inert or irrelevant amidst shifting global and Arctic economic, military, and environmental dynamics." Heather Conley, co-author of the CSIS report, said the findings are part of an emerging international discussion on revitalizing the Arctic Council. 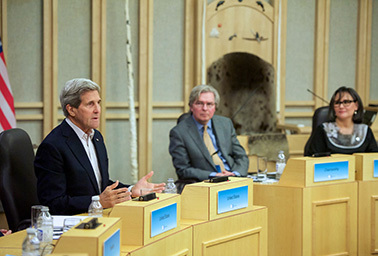 Secretary of State John Kerry (left) addresses members of the Arctic Council in Iqaluit, Canada, last year. The United States currently holds the rotating chair of the council. Photo by the State Department, courtesy of Flickr. "There are a lot of question marks about what the council should do," Conley noted. "Should it be in the policymaking realm? Should it start looking at broader policies that take an enforcer role, if you will, in making sure that countries implement the council's recommendations?" For example, Conley said, the council has approved "a phenomenal climate impact assessment." But some council members have been slow to adopt the study's proposals. "If the members of the Arctic Council aren't pursuing that on a national basis, then it's worthless." At the senior Arctic Council officials meeting, Balton said he favors maintaining the council's low level of formality and light institutional structure, which he said provides "a flexibility and nimbleness to the Arctic Council that does not exist in a number of other international organizations." But he called for creation of a long-term strategic plan that would help the council focus beyond each two-year chairmanship. Balton noted that the current system of rotating leadership "tends to introduce a kind of two-year mindset when a lot of the problems in the Arctic are really longer term than that." For the foreseeable future, however, Arctic Council members aren't likely to agree on a major overhaul of the group's mandate, primarily because some of the counties, notably Russia, are reluctant to shift gears on the council operations. Nils Andreassen, executive director of the Institute of the North, argued that for the long haul, the council is likely to remain more of "a barometer" on emerging Arctic issues. "They advance or identify issues as an early warning system, saying, 'Here's where there is a challenge or an opportunity,'" he said. "But if people are expecting direct investment or changes in policy, they should look to the individual states." Opening the door -- but how wide? The Arctic Council was created in 1996, five years after adoption of the Arctic Environmental Protection Strategy. That international pact was aimed in part at addressing the environmental damage caused in the Russian Arctic during the Soviet era. From the start, the international group has operated by consensus, with only the eight Arctic nations eligible to vote. The council also invited six Arctic indigenous groups to take part in council debates as "permanent participants." Over the years, the Arctic Council's working groups and expert panels have produced a steady stream of landmark scientific studies covering climate change, marine shipping and an impressive array of other Arctic issues. The northern nations have also used the council umbrella to negotiate two important multilateral agreements. In 2011, they signed an accord on marine search and rescue procedures. Two years later, the eight countries endorsed a pact on oil spill response. Although the Arctic Council nations retain control over final decisions, they've been slowly opening the door to other voices. When the council was created, the member nations allowed four non-Arctic countries and three interest groups to attend the panel's closed-door meetings as silent, nonvoting "official observers." Since then, the lineup of accredited observers has expanded to a total of 12 countries and 20 other organizations. In addition, the European Union has ad hoc observer status. Now 16 more applicants are waiting in the wings: four countries and 12 groups. Among those seeking observer status are Greenpeace and Oceana, as well as the International Chamber of Shipping and the International Association of Oil and Gas Producers. U.S. officials say they hope to have a decision on the new applicants by the time Finland takes over the council chairmanship next year. Margaret Williams, managing director of the World Wildlife Fund's Arctic program, favors broadening the number of non-Arctic nations and other groups allowed to take part in the council's working group and expert panel deliberations. The WWF is currently the only conservation group that serves as an Arctic Council observer. Williams argued that increased participation from non-Arctic nations could encourage quickly developing observer nations to act on climate change pollution. "Bringing these nations together and getting a vision for what needs to happen is really important," she said. "If India, which is moving toward modernization, could feel some responsibility to uphold the Arctic Council goals, like reducing black carbon, that could be huge." Some U.S. officials have expressed concern that the swelling roster of observers is limiting the council's ability to meet in Arctic communities, where large meeting rooms and hotels are at a premium. They note that council leaders are considering how to handle some observers that have never taken an active role in Arctic Council work. Meanwhile, the indigenous permanent participant groups have mixed feelings about broadening the lineup of observers. Those Native groups tend to have shoestring budgets that limit their travel to council meetings. They worry that their voices could be diluted as the new observers flood the committee meetings seeking to reshape council policy. At the same time, however, the indigenous representatives are hoping that the observers will help underwrite the Native groups' participation in council events. The indigenous organizations are working with the Institute of the North to create a funding mechanism that could raise money from the growing list of new council observers, Arctic businesses and outside groups. As the Arctic Council has expanded in importance and sheer size, the eight member countries in 2013 created a home base for the council staff in Tromsø, Norway. The Norwegian government is providing initial funding for the secretariat. Growing interest in Arctic issues has also spawned creation of two groups outside the council structure which are still in the startup phase -- one on commercial development and the other on maritime safety. Canada, which chaired the council from 2014-15, championed development of the Arctic Economic Council aimed at giving the business community a voice on circumpolar issues. The group represents a broad cross-section of Arctic economic interests, from mining and shipping companies to reindeer herding and Native corporations. AEC Chairwoman Tara Sweeney, executive vice president for Arctic Slope Regional Corp., said the group's mission is to "make the Arctic a favorable place to do business." "While the greater Arctic Council organization is focused on the environmental side of living in the Arctic, there needs to be a business perspective because the Arctic people need economies in order to continue to sustain our communities and our livelihood," Sweeney explained. Balton said plans are underway for the Arctic Council to partner with the AEC on developing public-private partnerships, with the first initiative to focus on improving the inadequate telecommunication networks now available in the circumpolar region. The second group, the Arctic Coast Guard Forum, was formalized last year by the U.S. Coast Guard and marine agencies from the seven other Arctic nations. That alliance is seeking to coordinate the nations' oversight of increased ship traffic in Arctic waters. Some experts suggest the group might also provide an informal opportunity for the nations to discuss Arctic security issues with Russia at a time when tensions continue over Russia's invasion of Ukraine. Meanwhile, the Obama administration has been reaching beyond the Arctic Council format to influence Arctic issues. Last year, the White House held a climate change conference in Anchorage, Alaska, during President Obama's historic visit to the state. The meeting drew high-level ministers from 10 nations and the European Union. This fall, the United States is planning a White House Science Ministerial on the Arctic in Washington, D.C., to bring together science ministers from Arctic Council nations and other countries with Arctic science programs. That event, scheduled to take place two months before the November election, could be Obama's last big opportunity to make a splash on Arctic climate change issues. The formal U.S. ministerial meeting for the Arctic Council, traditionally the main event for the nation chairing the council, is planned for next May in Fairbanks, Alaska. By then, however, a new president will be in charge of the U.S. council agenda. Lead Democratic presidential candidates Hillary Clinton and Vermont Sen. Bernie Sanders are likely to back Obama's aggressive climate change agenda. Clinton is an old hand at Arctic Council issues. While serving as secretary of State in 2011, she led the U.S. delegation to the council ministerial in Nuuk, Greenland. The top Republican presidential candidates, however, could reverse Obama's climate change initiatives. On the campaign trail, both Donald Trump and Texas Sen. Ted Cruz have questioned the need for government controls over climate change pollution. U.S. influence over Arctic issues will also decline as its term as Arctic Council chair ends. Whether climate change remains a major focus of the international panel will depend on which initiatives Finland promotes when it takes the council chair next year. Two years after that, Russia takes the lead. Balton said Finland plans to release its list of top Arctic Council priorities at the next senior officials meeting, which is scheduled in October in Portland, Maine.